This has been a holiday free year for me but despite that I've managed to travel extensively on business. Cologne, Amsterdam, Oslo, Barcelona, Chicago, Oslo, Switzerland and Oslo again. So just to make me even more holiday sick - I bring you Kho Phi Phi Leh's Maya Beach where the Thai epic, The Beach was filmed. OMG.... I have red hair! The Gallery is brought to the blogosphere courtesy of Tara from Sticky Fingers. Reminds me of my honeymoon,we went to Thailand and it is stunning, great picture. Not somewhere I've been but obviously happy memories for you. I suppose on business travel it's all a bit manic? Or do you get a chance to sightsee? Love the poses your children are making - can tell they do modelling. Very professional. I'd love to go there one day. Hope it calms down for you soon. Can I have your job sis? So it isn't just me who changes their hair colour! ok, you made me holiday sick too! would love to go there. At least you have the memories! I have red hair too! Looks like a happy holiday for you all! Love your blonde hair, but the red suits you too! 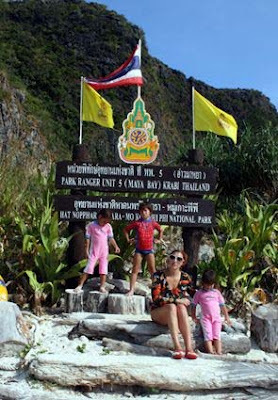 Thailand is a most beautiful place or seriously if you choose this place for the celebration of holiday then then you take a right decision...Also like all the pictures of these children..! !